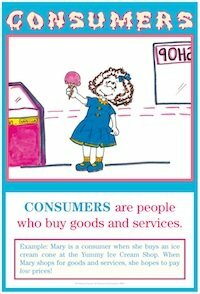 CONSUMERS are people who buy goods and services. Consumers face many choices of what to buy, and they cannot buy everything they would like to with their limited incomes. People's choices about what goods and services to buy and consume ultimately determine what producers produce and, thus, how productive resources will be used. List and/or draw goods and services that people consume. Write a paragraph entitled, "Goods and Services I Consume Every Day." Write a paragraph entitled, "Consumers Make Choices." Cut out pictures of people using goods and services and identify the goods and services being consumed. Plan a vacation trip. List the goods and services you will consume on the trip. Construct a pictorial graph showing people in three categories: consumers, producers, and both producers and consumers. Cut out coupons from a newspaper or magazine. Compute how much money you would save from using them. Students can save their allowance, use it to purchase (consume) goods and services, or give some of it away. Discuss the advantages and disadvantages of each option. Plan a budget for a week. Estimate how many goods and services you will purchase (consume). Also, estimate how much you would like to save or give away.